Contrary to popular belief, investing in your online brand is more than just spending money on that brand. It’s about establishing a unique identity that will resonate with your customers: one that will keep them returning for more, even without the promise of a promotion or deal dangling in front of their eyes. Successfully managing your online brand will help you bolster awareness and gain a positive reputation. It will also go a long way in fostering loyalty among your current clientele. Potential customers, meanwhile, will be more likely to see you, seek you out, and stay around for awhile. Your Brand: Benchmark results and goals. Establish your goals and results that you would like to benchmark. The only way to achieve success is to measure success. What changes do you want to see as a result of growing your online brand? What do you envision your online presence looks like in six months? Three years? Next week? Benchmark: In six months, we will be present on all review websites relevant to our market. Benchmark: In one year, we will show up in search results for top keywords in our segment. If you are not finding your business, neither are your potential customers. With more web traffic on mobile than on desktop, its best practice to ensure your brand is appearing properly on mobile first. Use Google My Business to help optimize your mobile responsiveness. To build an online brand management strategy, you must first have a clear picture of your audience. You may be tempted to create content strategies or communication plans right out the gate. However, establishing a sense of who your content is FOR and who you are speaking WITH is a step you don’t want to miss. Fortunately, there are plenty of tools out there to help you identify your audience, including products from comScore, Google and Compete. These tools allow you to learn the demographics of your audience, including; gender, age, marital status, household income, and location. Check out your competitors. Who are they networking with? Where do people you currently do business with interact online? What groups, functions, and information are they generally seeking? Track your social media followers. Who is most active on your competitor’s’ pages? What are they contributing? Search out groups related to your industry and join them. Take note of what information the group shares and what they value. Are you new to market segmentation and target audience development? Let’s go back to the basics. Roger Best’s well known seven-step, needs-based approach is a good starting point to help guide your decision-making by what matters most to your most desirable customer. These days, your prospective customers are probably searching locally. When they type “specialty grocery store” or “furniture repair shop” into a Google search, they’re looking to find locations near them. Make sure your location and phone number appear online. Clearly providing online citations of name, address, and phone number reduces the likelihood of a frustrating search (i.e., pulling up a nail salon in Chicago when you live in Phoenix). Utilizing tools like Foursquare can be fruitful for connecting with customers who are using mobile technology to identify businesses in close proximity, whereas tools like Google My Business provide businesses with the option to map beyond their own zip code by either providing a maximum distance of coverage or a zip code-based audience. You can develop a Communication Strategy in 4 steps. Maintain an open mind and consider all ideas a possibility. Take into account the voice your customers, reviewers, and followers use when THEY communicate online. When you begin creating content, your brand voice must speak with your audience—not at them. People respond better to a conversation that relates to them and engages them. People don’t want brands talking at them like they’re dollar signs – they want authentic communication. Maintain an authentic tone when posting and interacting with consumers – one that doesn’t seem forced. Always speak like a human being. Communicate directly with fans and followers and remain flexible and spontaneous. Talk about the things that matter most to your company and about what makes you unique. This is a simple strategy to get people talking about you, amplifying your brand’s reach. Example: Levi’s is a brand that does a fantastic job at remaining authentic. For starters, the company embraces authenticity by focusing primarily on their history and values. The company’s advertising, for example, invokes its deep legacy, while its social media communication helps raise awareness for causes it cares about in an effort to get customers talking. And they do. In doing so, it thrives on an identity as an original American brand in an increasingly global marketplace. Remember that voice and tone matter; they humanize your brand and let you take part in conversations naturally. Take the time to have genuine, real-time dialogue with customers and prospective customers. These conversations will better position your brand in a world of increasingly niche markets. Define and uphold a strong online voice and before you know it others will start doing your marketing for you! Example: Starbucks is a brilliant example of one of the most engaged brands on Twitter. They do an excellent job tracking down brand mentions of their followers AND non-followers and reply to them in real-time with helpful links, appreciation, thanks, apologies, and emojis. 😉 Consumers are delighted when a company takes the time to speak with them one-on-one – not to mention in a fun, relaxed way. Now, that’s expanding brand loyalty in 140 characters or less. Establish yourself as a thought leader in your line of business through compelling blog articles. Reach out to other bloggers in your industry. Comment on their posts and leave your blog’s URL behind. Perhaps they’ll return the favor. Don’t forget to link your blog to your company’s social media pages, so customers already active online can hop over and check you out. You can also establish a Content Strategy in 4 Steps. Once you’ve established your audience and voice, it is time to refine your communications by establishing a successful content strategy. The key here is to focus on the value your audience is seeking. Consider for a moment when someone offers you something of value, do you pay attention or dismiss it and walk away? Figure out what your target market wants to hear, the information they’re looking for, and more importantly, the way they want to hear it. Do they interact and share more readily in open forum or do they prefer to ingest their findings in a morning email? Remain cautious about self-promotion in an obvious way. Provide thoughtful answers to questions asked. Ask questions in return. When you are interacting online, are you engaging with the decision makers or insiders? If not, what are ways around this? How can you reach these people? And remember: Share, don’t sell. Balance your online media mix. Use display and content networks to build your brand through repetition, and get your content out in front of your audience by using behavioral targeting, site specific targeting and re-messaging. From an organic search perspective, make sure your brand name and content are consistent in your title tags and in your meta descriptions. By creating consistent messaging throughout the buying cycle, you allow consumers to continually recognize and remember your company. This will place you ahead of the pack when they are ready to make a purchase. Balancing your online media mix is all about getting seen and generating traffic from a variety of sources. The recipe for success is different for every business but you can be sure that online reputation and review profile management puts you ahead of the game by giving you the highest level of diversification. Plan your social media integration. What types of interactions do you want your consumers to have with your business on social media? Is Twitter the right fit? Instagram? You may not have all of the answers at this point, but a little research should help you understand where your audience is and how best to interact with them. Start by observing who is talking about your brand. If no one is, then START the conversation. But remember, it’s a conversation, not a means to force a message. Your brand will grow by leaps and bounds on social media if you remember to treat it as such. If you’d like info and more details on how to build a dedicated social media strategy, this guide is a great resource. Fantastic content is only fantastic if it truly resonates with your target audience. Take the time to really understand your readers. Research their challenges and develop content that speaks directly to these challenges. Publish it where and when they prefer. Example: Home improvement stores, such as Lowe’s, are a great fit for Pinterest. The home improvement customer is already using Pinterest to look for possible projects. Lowe’s can then engage this same customer with purchase ideas to make their dream projects a reality. Lowe’s even creates boards for smaller home decor projects. In fact, their most re-pinned project to date is that of a simple doormat DIY. The cost to complete the project with Lowe’s products? $35. Re-pins? 200,000. Now, did all 200,000 pinners run out and purchase these supplies? Probably not, but emotional investment through relevant content is priceless. Maintaining a solid presence on this particular platform shows that Lowe’s truly understands their audience and caters to their interests. 67 percent of consumers say they have used a company’s social media site to ask questions about products or services. Staying on top of this dialogue with your audience is a means of displaying helpful customer service. Moreover, 14 percent of tweets sent to major retail brands are from customers experiencing a problem IN-STORE. The difference between making a sale and a happy customer or not could be hitting “reply to tweet”. Example: @NikeSupport is the gold standard when it comes to helpful customer engagement. A quick glance at their account shows you how quickly and how OFTEN their representatives are responding to individual customers’ queries. With online customer service, it’s important to stay committed. This commitment will be rewarded twofold: happy customers and a public display of helpful and responsive service. Win-win! Monitor and respond to customer feedback by creating a Brand Reputation Strategy. A global survey ranks reputation as the top risk facing executives. Therefore, an effective Reputation Strategy can be tantamount to your company’s successful online brand. Building your brand reputation online is similar to a networking meeting. Unfortunately, it takes more time and refreshments will not be provided. Fortunately, you’ve already done a lot of leg work by identifying your audience and target audience. Next, you need to identify the tactics you’ll use to leverage this audience into bolstering reputation. Consider existing offline partnerships that can become online partnerships. These relationships will help build links pointing back to you and enhance your organic search presence. Overall, the more prevalent your brand becomes in the mind of your reputable peers, the stronger your brand reputation will grow online. Claim your business listings and review site pages. This can be a daunting task simply because of the sheer quantity of listings and sites lurking out there. However, doing so is going to lay the groundwork for further reputation building. Claiming and managing your online profiles can catapult your business to the next level. Start by creating or taking ownership of your profiles in the most prominent websites for your segment or industry and cascade your efforts into secondary websites, which will help you with online diversification and brand amplification. You can use this simple guide to help jumpstart your online review management efforts. Online reviews and ratings on Yelp, TripAdvisor, Foursquare, Citysearch, YP.com, and similar sites can have a big impact not just on your brand, but also on consumer behavior. According to the latest research, 88 percent of Internet users read reviews on sites like the ones listed above in order to determine the quality of a business. And 88 percent believe these reviews are as trustworthy as personal recommendations made by their friends and family. That’s huge! If your customers are attributing that much weight to an online review, shouldn’t you? Therefore, a major step in your online brand management strategy should focus on how online reviews of your business are affecting your online reputation. Spend some time analyzing and developing your profile on Yelp and any other major review sites where your business might be listed. Construct consistent profiles across all review sites. Once you’ve analyzed and developed those initial profiles, work on having clear and consistent messaging across ALL your review site profiles. Your profile could include hours of operation, descriptions of services, menu offerings, detailed accounts of your rooms, or items you always have in stock. And of course, make sure your address, phone numbers, and relevant emails are correct. Finding you should be EASY, not frustrating. Responding to online reviews is not only smart for keeping your customers around, but it is also a magnificent way to showcase customer commitment to those browsing your profile and considering doing business with you for the first time. Responses to both positive AND negative reviews can strengthen credibility and provide a simple avenue for you to connect with your customers. Studies show that a response to a negative review is often the trigger for that all-important second chance, and may even help lead to long-term brand loyalty. Approach your responses professionally. Proofread each one for grammar, customer focus, and brand voice before hitting “publish.” Follow up your responses with actionable items. Deliver on your promises and provide the solution.But also, adapt your existing practices to make sure they improve based on review feedback. Approach negative reviews as a problem-solver. Negative reviews are usually the result of a complaint that was met with indifference. Set your brand apart by not just listening to problems, but choosing to FIX problems. Sure, customers want to be heard, but they also want to see change, especially when their experience was a bit off. Fix these problems on the spot to sidestep the possibility of it resulting in a negative review later. Customer escalations can quickly blemish your online profile. Of course, some problems will go unresolved, and you won’t discover them until reading the negative review. Spring into that same problem-solver action just the same. Write a response that seeks to fix the problem. Invite them to come back for a better experience. The goal here is brand credibility and customer trust. Check out this interview with Don Sorenson, president of Big Blue Robot, about what marketing executives can do to protect their company’s good image online. His answers not only highlight the importance of a Reputation Strategy but also provide some useful tips. Congratulations! 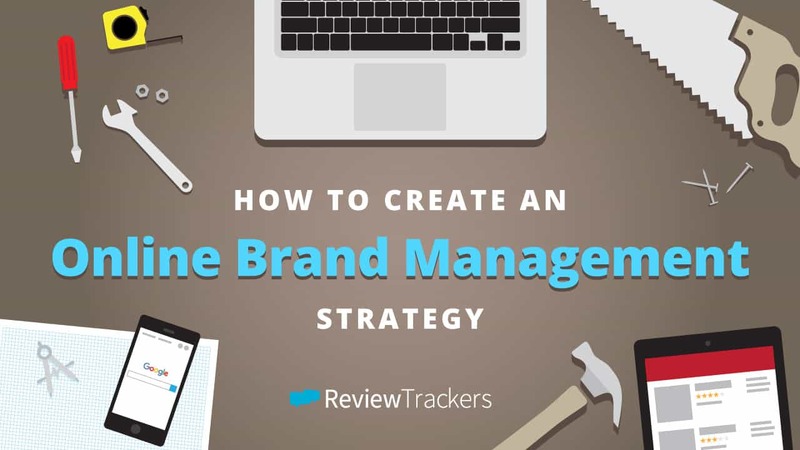 You’ve established an online brand management strategy. You’re communicating with your customers online, providing them with amazing and helpful content, and utilizing review sites to bolster your reputation. But the work doesn’t just stop here. As time passes, it’s important to continually measure your results against your set goals. Re-evaluate those goals. Set new ones. The way businesses approach online brand management is ever growing and evolving. Your brand should do the same. Really interesting article! You make a lot of good points about things that seem commonsensical, but are just hard to put into words! Visibility is the utmost importance of any business which is to make a brand of itself. The above article is a very good write up for budding marketing students. It is true that you will get better results if you are intentional about the times and days that you submit your posts. I have made the mistake of posting blogs and Ebay auctions late at night and it had a direct impact on how many people saw or interacted with my posts. A very helpful article for a new startup thinker. Nice writeup. Brand idealization is the most difficult part in a business due to the constant consistency it has to cater to the users. The above article beautifully displays how a business can sustain itself in the long run. Really good article, compact, well said. It is really visible that lot’s of effort was put into it. Everyone should be using this as guidelines.